Changing Planes by Ursula K. Le Guin is a book based on a little pun — the idea that the relentless hostility of airports to the human mind can, at times, drive a person out of our plane of reality and into another. While waiting to change planes, then, one might find one’s self actually changing planes. Since only a few minutes pass in one’s home plane while one is traveling through another, there’s no reason not to spend one’s layover napping on a tropical beach or hiking through some other world’s mountains. Changing Planes doesn’t have a plot as such. It’s a series of vignettes of the different planes one might choose to visit. Each one is enthrallingly lyrical (I was almost sucked back into the book in the process of writing this review) and drawn with the eye for telling detail that has always made Le Guin’s writing stand out from the rest of genre fiction. Each chapter addresses a different world. The shift in tone ought to be jarring, but isn’t — though she focuses on a different aspect of humanity in each world the protagonist (such as there is) visits or hears about, the book still stands as a cohesive whole. When I picked up Changing Planes, I didn’t realize that I had already read two of the chapters when they were published as short stories in Lightspeed Magazine. One of them — “The Silence of the Asonu” — stayed on my iPod for a while so that I could re-listen to it. I love the feelings it evokes. It is not a happy story — few of these chapters are happy stories. The deep mystery of the silence of the Asonu combined with the ridiculous mysticism that tourists have projected onto them call to mind a pattern that I am familiar with from our world. That the story takes such a dark turn at the end fits that pattern. Science fiction is at its best when it reflects aspects of our shared humanity back at us. The worlds in Changing Planes are similar to ours, with a few telling changes. I believe that anyone who reads these stories will come away with a clear idea of what Le Guin was criticizing about our society — but I don’t think any two people will necessarily agree about what that was. Take the other story that is available in Lightspeed: “The Island of the Immortals.” Is it a commentary on the quest for eternal life? Or a statement about how a society chooses to treat its elderly? Both? Or something else? Even stories that don’t feel particularly nuanced proved to be more complicated than they appeared once I tried to pick them apart. For example, I remembered the chapter called “Great Joy” as a straightforward commentary on corporate greed. Upon rereading, it was clearly a scathing criticism of the commodification of holidays. Changing Planes will frustrate some readers. It does lack a plot and a clearly-drawn protagonist. Its style reminded me most strongly of Always Coming Home — which happens to be my favorite work by Le Guin. I think it will speak to people who love science fiction for its own sake, and not just for the superficial trappings of rockets and starships. Le Guin is once again trying to make her readers look at the world in a new way. Whether or not Changing Planes succeeds in doing that will depend on the reader. 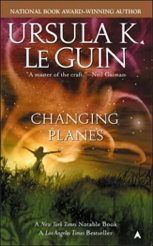 Fans of Le Guin should give Changing Planes a look. Readers who are on the fence should read or listen to the two chapters published in Lightspeed before making up their minds.